But that is not the topic of this post. • There have been attacks to de-anonymize tor hidden services (certain conditions apply). 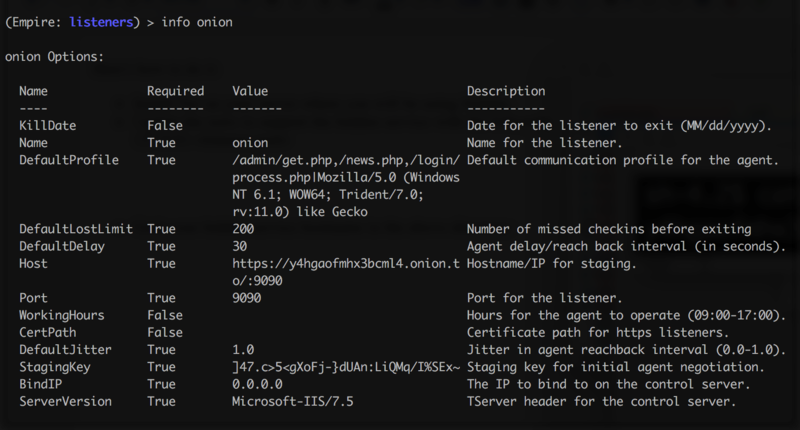 • Install Tor on your server where you will be using Empire. • Set up your listener. In the screenshot below I'm using .onion.to as the domain. It's typed correctly: https://y4hgaofmhx3bcml4.onion.to/:9090 Note the /:<PORT> after the onion.to -that's the correct syntax. I set the DefaultDelay and Jitter at higher intervals because Tor can be slow at times. • The Tor2Web site in this demo uses TLS 1.2 AES-256-GCM with ECDHE_RSA for key exchange. • Traffic from the Tor2Web URL redirector is encrypted via the normal tor encryption method all the way to the hidden service. Ok that's it, enjoy your shells responsibly! * Metasploit would have worked also, just wanted to give Empire a shot. Please guide me through this problem.